Methods used in service design enable the acquisition of in-depth customer understanding. Methods used in service design enable the acquisition of in-depth customer understanding that eventually guide the design of new service ideas and concepts. By prototyping ideas and concepts you can communicate and demonstrate the service to the stakeholders and end-users. It is easier to assess the service when you can actually try it out. With prototyping you can see how the service is able to meet customer needs and find suggestions for development. As success of a concept is always uncertain, it is by prototyping one can postpone the investment decision and lessen economical risk. Prototyping can be applied at different stages of the planning and design process and in different scopes and extents. Journalist Reetta Räty took a tour in three different service design offices and heard examples of service prototyping. These days, service design equals user-centered design, with a holistic adoption of the customers perspective as the starting point and philosophy. Which direction should we take, and how are competitiveness and customer experience formed when one takes on the customers point of view? Our project for Fazer Bakeries serves as a good example of service design and prototypes. Similar trends that have been evident in the case of coffee and beer have also applied to the world of bread, with everything from prepackaged bread to in-store baked, slow rise, and artisan type varieties on offer. 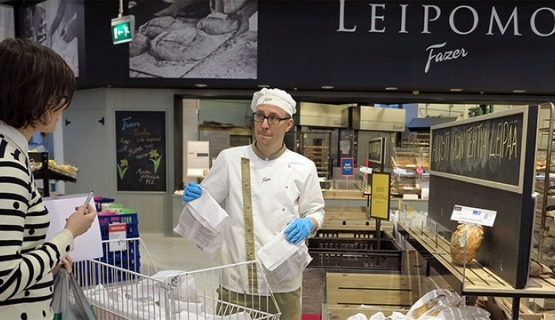 Fazer Bakeries wanted to overhaul its selection to ensure that also the latter - bread fresh out of the oven actually made by bakers – would be available in stores in addition to the existing service of bread prepared in in-store ovens. As bakers and bakeries entered the stores, people didnt believe or realize that the bread was actually baked right there! According to marketing surveys, customers believed the bread was still brought in from somewhere else, and the flour and bakers were there only for show. What is important is that the methods for improving customer experience and satisfaction stemmed from the daily lives of customers and makers. We began to look for a solution for the dilemma by clarifying and trying to understand the customer point of view. We first conducted some background research: what goes through peoples minds when they visit a store, and why is it that the goal and reality do not always align? Also bakers were included in the project, which led to some interesting encounters with customers: Do you actually bake here? they would often wonder. Bakers giving out samples and chatting to customers ensured that the message went successfully across even to the most doubtful customers. Research results and experiences served as a basis for developing new solutions, which were then piloted in two stores. In one of the stores, a world inspired by Finnish alcoholic beverage retailing monopoly Alko was put to the test, where the focus is on expert services and presenting product information. The idea was to explain to customers how the bread had been made, and how elements like a certain viscosity, crispiness, and crust had been achieved. By presenting information, the aim was to help customers in their decision-making. The second pilot had a market-type approach, with an emphasis on the local and the individual. Bakers appeared with their own faces and names to recommend and tell customers about their products. Customers in turn realized that this really is the person behind the bread. A market-type environment brings a human touch and level of expertise often found in smaller shops. Although the project is still underway, we have already found out how activities can be realigned to achieve a certain goal. Identified measures will be put to practice together with bakery supervisors and bakers. What is important is that the methods for improving customer experience and satisfaction stemmed from the daily lives of customers and makers. When card payment readers were introduced to slot machines, Finlands Slot Machine Association RAY faced a problem of the card payment option not really taking off despite people carrying less cash with them, especially coins. We began to uncover why this was the case. Customer interviews highlighted that there were certain suspicions involved with card payments: people were concerned they would go into their monthly grocery budget, and lose a grip on their finances. However, they were unaware of certain features of the card payment option, such as the possibility to set a spending limit for slot machines. Customer interviews served as a basis for ideating ways to communicate about the card payment features in arcades. These operating models, posters, instructions, and messages were then prototyped, and functional methods were clarified. At the initial stage, prototypes are quick sketches to explain the situation in simple terms: what needs be done for the service to work for customers, and increase revenue. In other words, a prototype makes the customer experience concrete, while at a later stage, it also highlights aspects of the experience that work or do not work. In this case, it turned out that players hardly noticed the new instructions and posters brought to the arcades. In other words, despite customers coming face to face with the prototypes, the message failed to get across. Different ways to make contact with players and introduce the new payment methods were prototyped together with staff, which brought considerably better results than the instructions. First some myths that staff had about customers needed to be busted, as some were under the perception that customers wouldnt want to be approached. This myth was proven wrong during the trial; customers actually appreciated personnel making contact and coming over for a chat. Service design and prototyping work from the starting point that the end user perspective is integrated into the design at an early stage. Our expert work doesnt allow us to design what customers do in an arcade, but as design professionals we are able to illustrate ideas, user interfaces, and, for instance, the behavior of personnel: How would it work if you did this? Personnel at RAY are the key to change. At present, supervisors are involved in thinking up ways to steer the production of customer experience in arcades, and management, staff, and customers are always included in the design. A model of this type means giving customers a say in how they should be served, rather than supervisors telling employees theyll be taking on a new model, heres the training. We were thinking about ways to improve customer experience at cinemas together with personnel at Finnkino cinema chain. Ideas were collected through customer workshops and idea competitions for the whole company. The most interesting and promising ideas were then tested during Cinema Lab periods at Tennispalatsi and Finnkino cinemas. A dozen or so ideas were put to the test, ranging from experience-type ideas to concrete products. Concrete product ideas included candy cups; a standard-sized cup with a set price, which make it easier for children to choose confectionary without parents having to supervise the final price or amount. A kids VIP birthday party was an example of an experience-type idea, which involved a tour around the cinema together with staff, seeing old film projectors, and the birthday child receiving a personal birthday message on the movie screen. The concept was tested on six groups of children and adults, with especially the cinema tour receiving a warm welcome. Tests of this type are a good way to for instance establish for which age groups a personal on-screen message works. The idea of prototyping is to gather both feedback and development ideas. Customers do not necessarily know what they want beforehand, but when they are included in testing and get to try out different prototypes, they are able to provide analytic feedback and suggestions. How does a certain experience work, what are the reactions, how can it be improved? The project for Finnkino has now reached a stage of the most important findings and ideas being put into practice. Service design is a clear trend in all development work. Personally, I see service design as a way to create relevant services and experiences with a customer orientation, as opposed to developing organization-centered products as cheaply as possible. These days, consuming takes place on an emotional level, and companies need to move closer to the customer. It is vital to understand what makes customers tick, and how a relationship with a brand is formed. This is what service design aims to address. Companies are facing a situation where someone else can always manufacture a product more inexpensively. In other words, they can no longer only compete through price, but need to stand out in other ways.